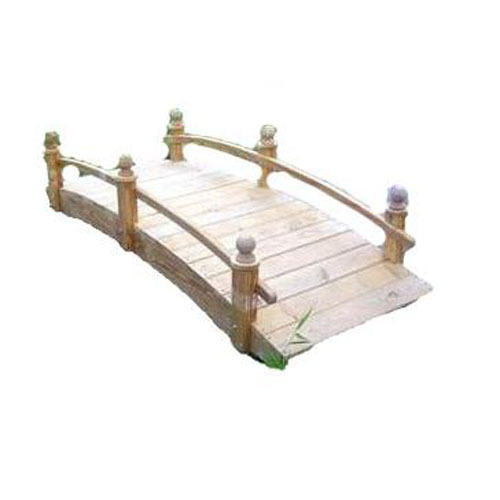 This single rail bridge is a wonderful bridge that is designed to accent any garden or pathway. It's hand crafted from 100% arsenic free wolmanized natural select wood. It is built to beautify and to last. 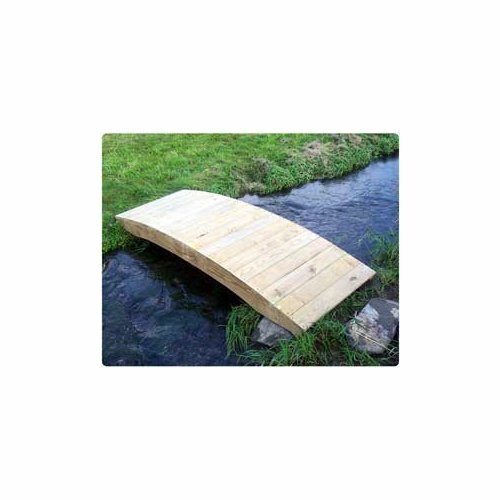 The Amelia Bridges come with 2" x 12" support beams, 1" x 6' decking, stainless steel screws, galvanized bolts, washers, and nuts, and comes planed and sanded. The 10' Amelia Bridge has a 104" Max. Span, 36" Width, 600 lb. Max Load, and has 33.25" Between Posts. Repair holes and tears up to 3" long in all ShelterLogic polyethylene covers. 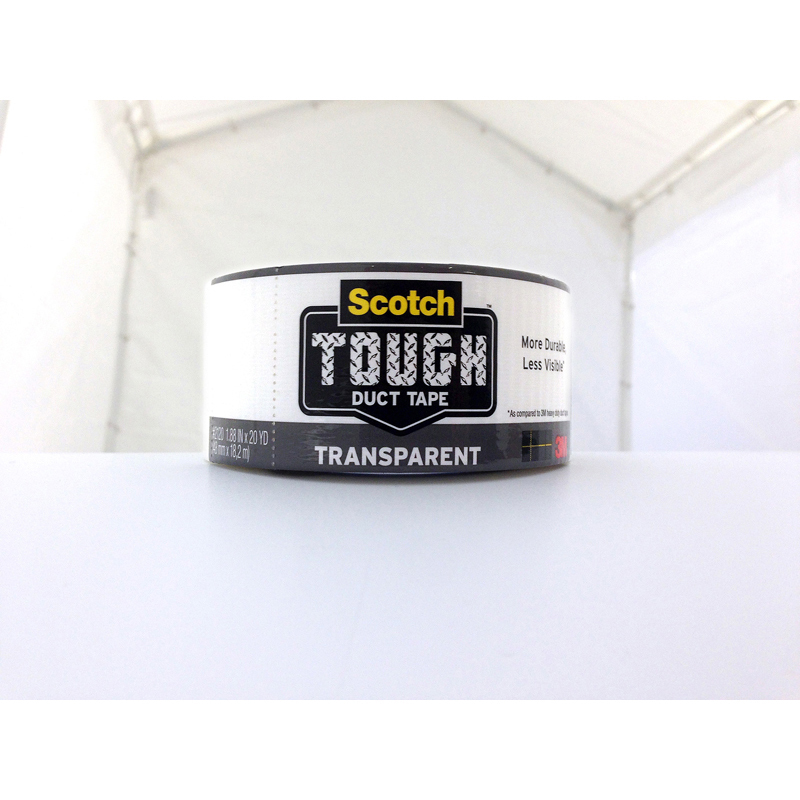 Transparent Scotch® Tough Duct Tape has been tested for durability on our PE covers through extreme winter and summer temperature. The clear tape is less visible than standard tapes. It is designed specifically to be UV and water resistant for longer life. It is very flexible and easy to unwind for simple repairs. Simple yet elegant, this arch design will still make your garden the talk of the town. With its straightforward design, magnificence, and grace it is a great way to cross a stream pond or pathway. As with all our bridges it is build to last and still be a delight to view. The Fiore Bridges come with 2" x 12" support beams, 1" x 6' decking, stainless steel screws, galvanized bolts, washers, and nuts, and comes planed and sanded. The 12' Fiore Bridge has a 128" Max. Span, 36" Width, 600 lb. Max Load, and has 12" Height (to top of middle). The Keira Bridge is grace and elegance forged into this breathtaking double rail beauty. 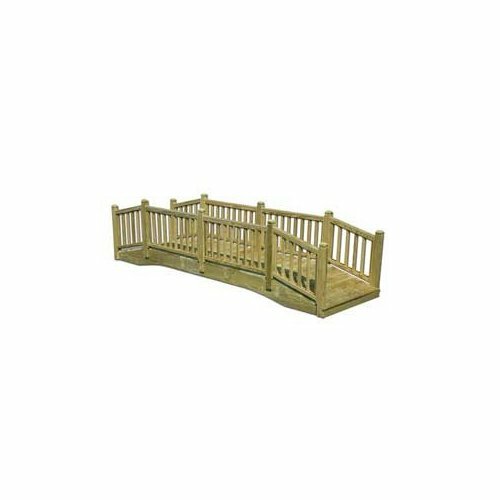 This is our best selling bridge because of its magnificent charm and the fantastic addition it makes to any garden setting. The Keira Bridges comes with 2" x 12" support beams, 1" x 6' decking, stainless steel screws, galvanized bolts, washers, and nuts, and comes planed and sanded. The 6' Keira Bridge has a 56" Max. Span, 36" Width, 400 lb. Max Load, and has 33.25" Between Posts. Dim: 10' L x 3' W. 2x6 Decking, 2x12 Beams, 2200lbs weight capacity, and ships fully assembled or a simple kit form. All of our bridges feature a magnificent design and charm plus make a fantastic addition to any pathway setting. Made from Arsenic Free Treated Pine. We treat our pine lumber before and after being kiln dried. Because of this treatment our pine does not warp or bend, and also resists decay, disease, as well as rotting. Treated pine is ideal for painting. Comes with stainless steel screw, galvanized bolts, washers, and nuts. Dim: 12' L x 3' W. 2x6 Decking, 2x12 Beams, 2200lbs weight capacity, and ships fully assembled or a simple kit form. All of our bridges feature a magnificent design and charm plus make a fantastic addition to any pathway setting. Made from Arsenic Free Treated Pine. We treat our pine lumber before and after being kiln dried. Because of this treatment our pine does not warp or bend, and also resists decay, disease, as well as rotting. Treated pine is ideal for painting. Comes with stainless steel screw, galvanized bolts, washers, and nuts. Dim: 14' L x 3' W. 2x6 Decking, 2x12 Beams, 2200lbs weight capacity, and ships fully assembled or a simple kit form. All of our bridges feature a magnificent design and charm plus make a fantastic addition to any pathway setting. Made from Arsenic Free Treated Pine. We treat our pine lumber before and after being kiln dried. Because of this treatment our pine does not warp or bend, and also resists decay, disease, as well as rotting. Treated pine is ideal for painting. Comes with stainless steel screw, galvanized bolts, washers, and nuts. Dim: 16' L x 3' W. 2x6 Decking, 2x12 Beams, 2200lbs weight capacity, and ships fully assembled or a simple kit form. All of our bridges feature a magnificent design and charm plus make a fantastic addition to any pathway setting. Made from Arsenic Free Treated Pine. We treat our pine lumber before and after being kiln dried. Because of this treatment our pine does not warp or bend, and also resists decay, disease, as well as rotting. Treated pine is ideal for painting. Comes with stainless steel screw, galvanized bolts, washers, and nuts. Dim: 18' L x 3' W. 2x6 Decking, 2x12 Beams, 2200lbs weight capacity, and ships fully assembled or a simple kit form. All of our bridges feature a magnificent design and charm plus make a fantastic addition to any pathway setting. Made from Arsenic Free Treated Pine. We treat our pine lumber before and after being kiln dried. Because of this treatment our pine does not warp or bend, and also resists decay, disease, as well as rotting. Treated pine is ideal for painting. Comes with stainless steel screw, galvanized bolts, washers, and nuts. Dim: 12' L x 6' W. 2x6 Decking, 2x12 Beams, 2200lbs weight capacity, and ships fully assembled or a simple kit form. All of our bridges feature a magnificent design and charm plus make a fantastic addition to any pathway setting. Made from Arsenic Free Treated Pine. We treat our pine lumber before and after being kiln dried. Because of this treatment our pine does not warp or bend, and also resists decay, disease, as well as rotting. Treated pine is ideal for painting. Comes with stainless steel screw, galvanized bolts, washers, and nuts. Dim: 14' L x 6' W. 2x6 Decking, 2x12 Beams, 2200lbs weight capacity, and ships fully assembled or a simple kit form. All of our bridges feature a magnificent design and charm plus make a fantastic addition to any pathway setting. Made from Arsenic Free Treated Pine. We treat our pine lumber before and after being kiln dried. Because of this treatment our pine does not warp or bend, and also resists decay, disease, as well as rotting. Treated pine is ideal for painting. Comes with stainless steel screw, galvanized bolts, washers, and nuts. Dim: 6' L x 3' W. 2x6 Decking, 2x12 Beams, 2200lbs weight capacity, and ships fully assembled or a simple kit form. All of our bridges feature a magnificent design and charm plus make a fantastic addition to any pathway setting. Made from Arsenic Free Treated Pine. We treat our pine lumber before and after being kiln dried. Because of this treatment our pine does not warp or bend, and also resists decay, disease, as well as rotting. Treated pine is ideal for painting. Comes with stainless steel screw, galvanized bolts, washers, and nuts. Dim: 8' L x 3' W. 2x6 Decking, 2x12 Beams, 2200lbs weight capacity, and ships fully assembled or a simple kit form. All of our bridges feature a magnificent design and charm plus make a fantastic addition to any pathway setting. Made from Arsenic Free Treated Pine. We treat our pine lumber before and after being kiln dried. Because of this treatment our pine does not warp or bend, and also resists decay, disease, as well as rotting. Treated pine is ideal for painting. Comes with stainless steel screw, galvanized bolts, washers, and nuts. Dim: 10' L x 4' W. 2x6 Decking, 2x12 Beams, 2200lbs weight capacity, and ships fully assembled or a simple kit form. 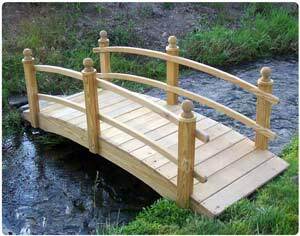 All of our bridges feature a magnificent design and charm plus make a fantastic addition to any pathway setting. Made from Arsenic Free Treated Pine. We treat our pine lumber before and after being kiln dried. Because of this treatment our pine does not warp or bend, and also resists decay, disease, as well as rotting. Treated pine is ideal for painting. Comes with stainless steel screw, galvanized bolts, washers, and nuts. Dim: 12' L x 4' W. 2x6 Decking, 2x12 Beams, 2200lbs weight capacity, and ships fully assembled or a simple kit form. All of our bridges feature a magnificent design and charm plus make a fantastic addition to any pathway setting. Made from Arsenic Free Treated Pine. We treat our pine lumber before and after being kiln dried. Because of this treatment our pine does not warp or bend, and also resists decay, disease, as well as rotting. Treated pine is ideal for painting. Comes with stainless steel screw, galvanized bolts, washers, and nuts. Dim: 14' L x 4' W. 2x6 Decking, 2x12 Beams, 2200lbs weight capacity, and ships fully assembled or a simple kit form. All of our bridges feature a magnificent design and charm plus make a fantastic addition to any pathway setting. Made from Arsenic Free Treated Pine. We treat our pine lumber before and after being kiln dried. Because of this treatment our pine does not warp or bend, and also resists decay, disease, as well as rotting. Treated pine is ideal for painting. Comes with stainless steel screw, galvanized bolts, washers, and nuts. Dim: 16' L x 4' W. 2x6 Decking, 2x12 Beams, 2200lbs weight capacity, and ships fully assembled or a simple kit form. All of our bridges feature a magnificent design and charm plus make a fantastic addition to any pathway setting. Made from Arsenic Free Treated Pine. We treat our pine lumber before and after being kiln dried. Because of this treatment our pine does not warp or bend, and also resists decay, disease, as well as rotting. Treated pine is ideal for painting. Comes with stainless steel screw, galvanized bolts, washers, and nuts. Dim: 18' L x 4' W. 2x6 Decking, 2x12 Beams, 2200lbs weight capacity, and ships fully assembled or a simple kit form. All of our bridges feature a magnificent design and charm plus make a fantastic addition to any pathway setting. Made from Arsenic Free Treated Pine. We treat our pine lumber before and after being kiln dried. Because of this treatment our pine does not warp or bend, and also resists decay, disease, as well as rotting. Treated pine is ideal for painting. Comes with stainless steel screw, galvanized bolts, washers, and nuts. Dim: 6' L x 4' W. 2x6 Decking, 2x12 Beams, 2200lbs weight capacity, and ships fully assembled or a simple kit form. All of our bridges feature a magnificent design and charm plus make a fantastic addition to any pathway setting. Made from Arsenic Free Treated Pine. We treat our pine lumber before and after being kiln dried. Because of this treatment our pine does not warp or bend, and also resists decay, disease, as well as rotting. Treated pine is ideal for painting. Comes with stainless steel screw, galvanized bolts, washers, and nuts. Dim: 8' L x 4' W. 2x6 Decking, 2x12 Beams, 2200lbs weight capacity, and ships fully assembled or a simple kit form. All of our bridges feature a magnificent design and charm plus make a fantastic addition to any pathway setting. Made from Arsenic Free Treated Pine. We treat our pine lumber before and after being kiln dried. Because of this treatment our pine does not warp or bend, and also resists decay, disease, as well as rotting. Treated pine is ideal for painting. Comes with stainless steel screw, galvanized bolts, washers, and nuts. Dim: 10' L x 5' W. 2x6 Decking, 2x12 Beams, 2200lbs weight capacity, and ships fully assembled or a simple kit form. All of our bridges feature a magnificent design and charm plus make a fantastic addition to any pathway setting. Made from Arsenic Free Treated Pine. We treat our pine lumber before and after being kiln dried. Because of this treatment our pine does not warp or bend, and also resists decay, disease, as well as rotting. Treated pine is ideal for painting. Comes with stainless steel screw, galvanized bolts, washers, and nuts. Dim: 12' L x 5' W. 2x6 Decking, 2x12 Beams, 2200lbs weight capacity, and ships fully assembled or a simple kit form. All of our bridges feature a magnificent design and charm plus make a fantastic addition to any pathway setting. Made from Arsenic Free Treated Pine. We treat our pine lumber before and after being kiln dried. Because of this treatment our pine does not warp or bend, and also resists decay, disease, as well as rotting. Treated pine is ideal for painting. Comes with stainless steel screw, galvanized bolts, washers, and nuts. Dim: 14' L x 5' W. 2x6 Decking, 2x12 Beams, 2200lbs weight capacity, and ships fully assembled or a simple kit form. All of our bridges feature a magnificent design and charm plus make a fantastic addition to any pathway setting. Made from Arsenic Free Treated Pine. We treat our pine lumber before and after being kiln dried. Because of this treatment our pine does not warp or bend, and also resists decay, disease, as well as rotting. Treated pine is ideal for painting. Comes with stainless steel screw, galvanized bolts, washers, and nuts. Dim: 16' L x 5' W. 2x6 Decking, 2x12 Beams, 2200lbs weight capacity, and ships fully assembled or a simple kit form. All of our bridges feature a magnificent design and charm plus make a fantastic addition to any pathway setting. Made from Arsenic Free Treated Pine. We treat our pine lumber before and after being kiln dried. Because of this treatment our pine does not warp or bend, and also resists decay, disease, as well as rotting. Treated pine is ideal for painting. Comes with stainless steel screw, galvanized bolts, washers, and nuts.